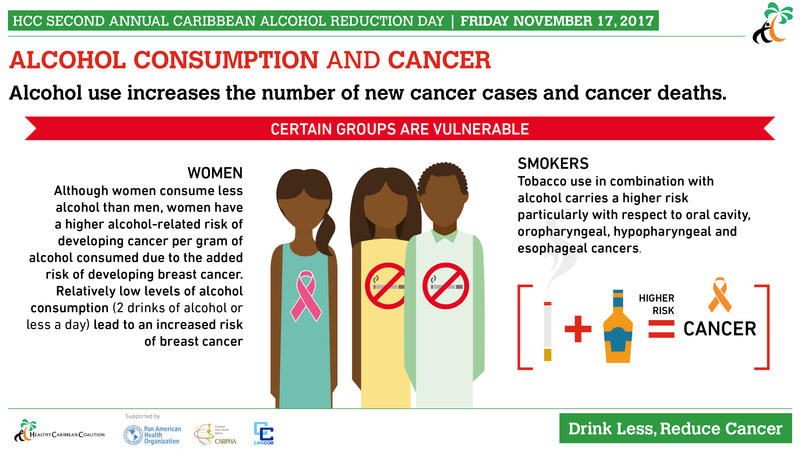 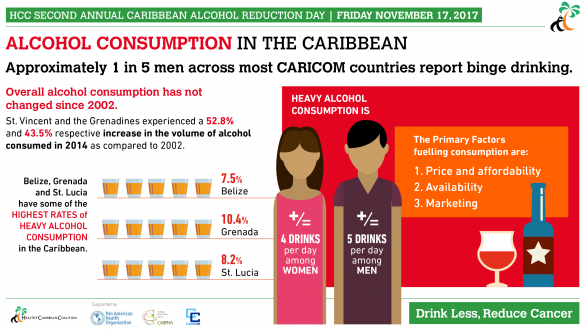 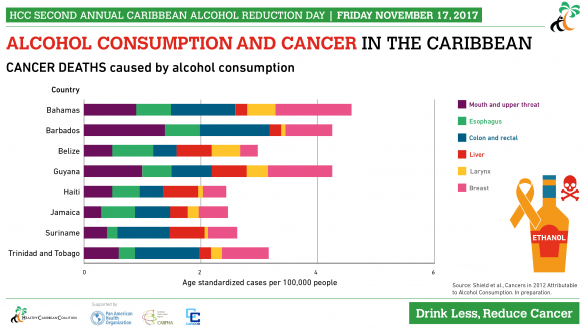 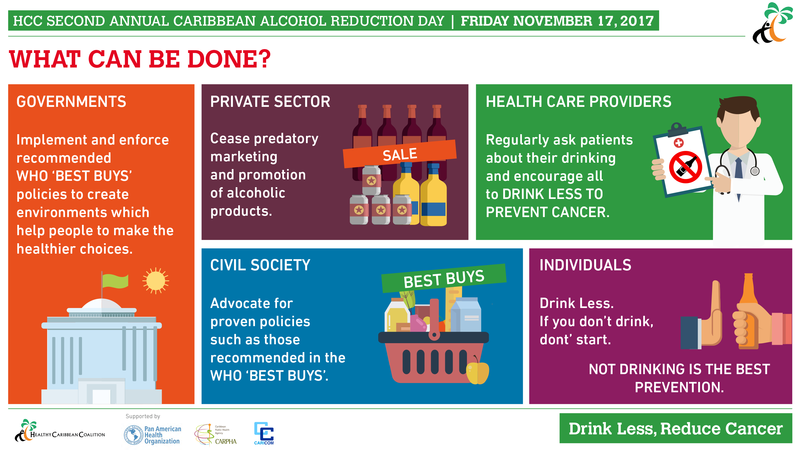 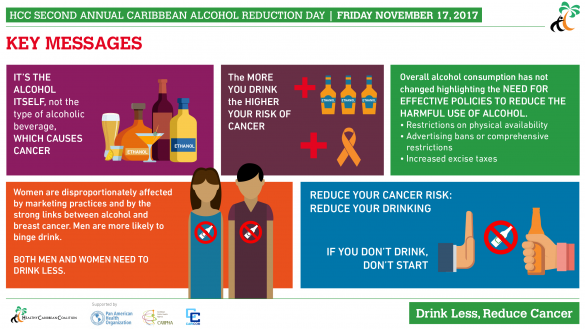 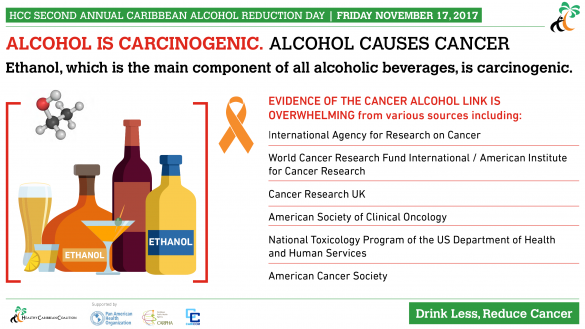 HCC and it’s partners PAHO, CARPHA and CARICOM present the 2nd Annual Caribbean Alcohol Reduction Day (CARD). The theme this year is: Drink Less, Reduce, Cancer. The harmful use of alcohol, along with tobacco use, unhealthy diet and physical inactivity, is recognized as one of four major common risk factors for NCDs; yet alcohol has received comparatively less attention than the other 3 risk factors. Alcohol contributes to cancer, liver and heart disease, mental illness, violence, accidents and injuries. Alcohol consumption causes many cancers including: Mouth cancer, Pharyngeal cancer (upper throat), Oesophageal cancer (food pipe), Laryngeal cancer (voice box), Breast cancer, Bowel cancer, and Liver cancer. Globally the harmful use of alcohol is linked to 3.3 million preventable deaths annually. 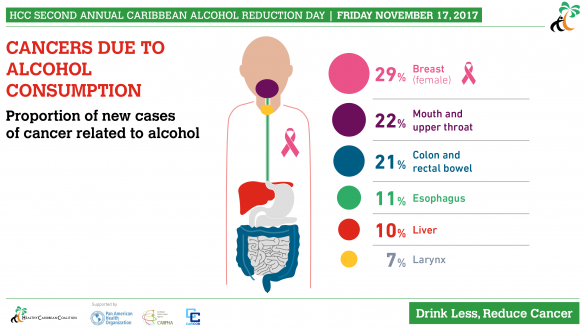 Excessive drinking of alcohol is a major health risk, occurring particularly increasingly among Caribbean youth resulting in alcohol related violent deaths among the top 5 causes of death in the region and the commonest cause of death among young men. 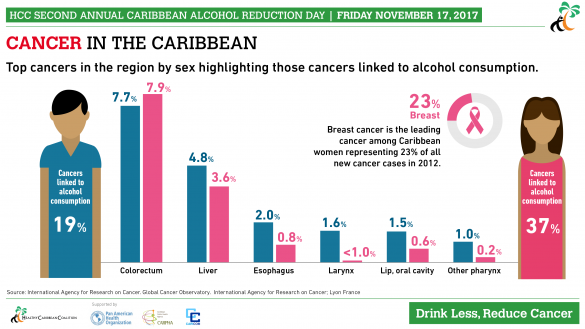 Young women are especially vulnerable; alcohol consumption disproportionately increases the risk of breast cancer between menarche and first birth. Increase public and policymaker awareness about the harmful effects of alcohol misuse. Increase public and policymaker awareness about the links between alcohol consumption and cancer risk. Call on Policy makers to implement specific policies to reduce alcohol consumption. 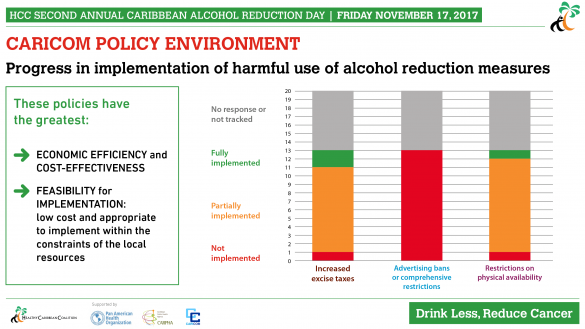 In order to create environments in which drinking less is the easier option, the HCC calls on governments to implement supportive policies. The call to action this year is in line with the updated WHO Best Buy Interventions to reduce the harmful use of alcohol. 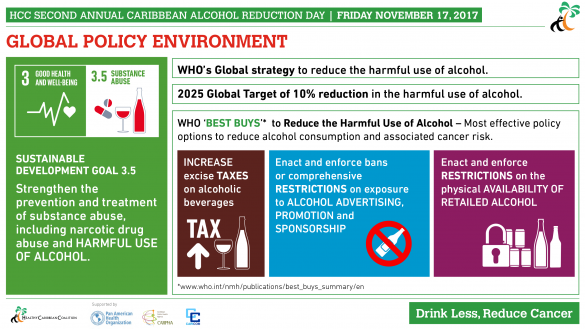 Global and regional experts including: Dr. Kevin Shield, Independent Scientist, Institute for Mental Health Policy Research, Head, WHO/PAHO Collaborating Centre, Centre for Addiction and Mental Health (CAMH), Dr. Maristela Monteiro, Senior Advisor Alcohol and Substance Abuse, PAHO and Dr. Rohan Maharaj, HCC Alcohol Policy Advisor, discussed the harmful use of alcohol and its intersection with cancer risk, and explore the policy options to reduce the harmful use of alcohol among Caribbean people. 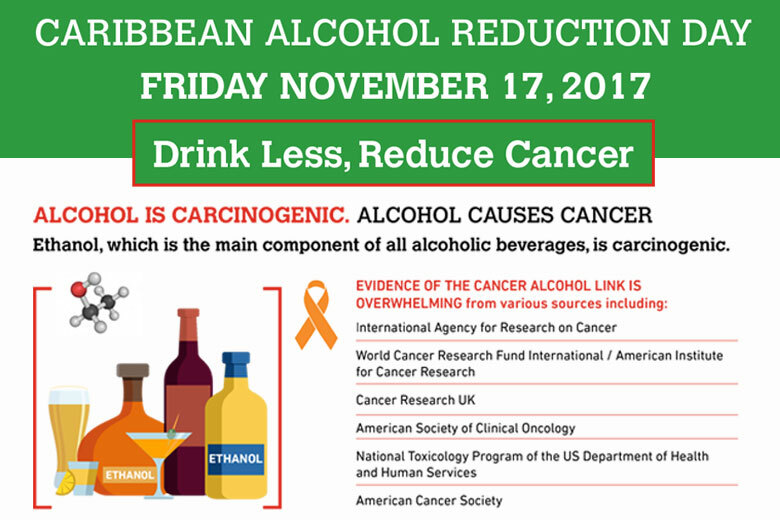 Read more about the webinar and watch a recording of it here.